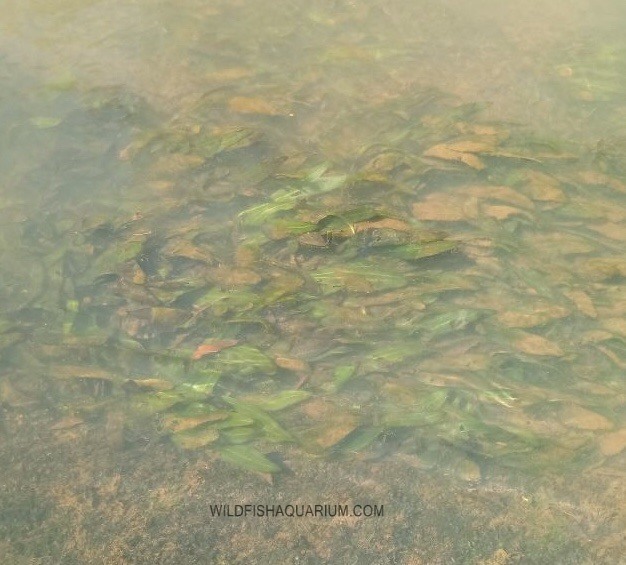 Years ago, when I went to this beautiful province for the first time, I asked myself which fish would inhabit the Iguazu Falls, although I like all the fish, my thoughts were oriented (as always) towards the aquarium fish. A little information about this pearl of the Argentine north. 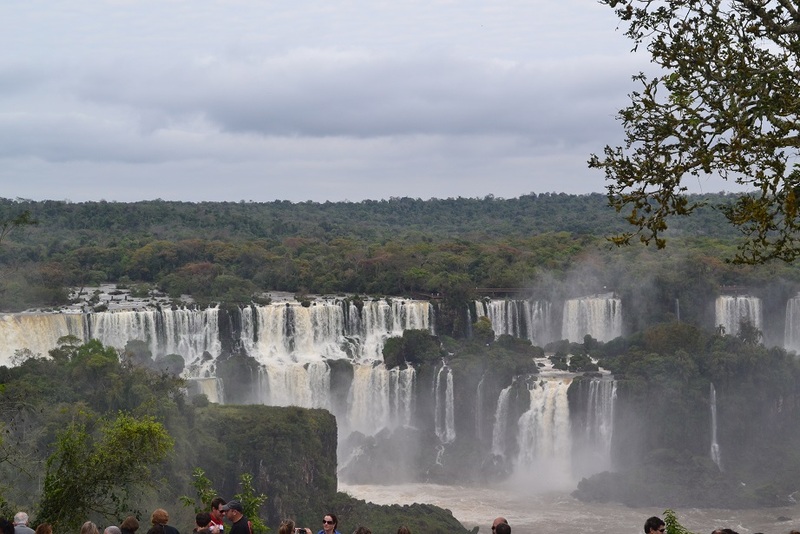 The province of Misiones has an area of ​​29,801km² and is the second largest in the provinces of the Argentine Republic, integrating the Brasilia massif through the missionary plateau. Its rocks contain important amounts of iron, it decomposes and forms part of the soil, giving it the characteristic red color (see photos) that often stains roads and streams after a storm. View from the car on the way to one of the sought-after habitats. The colour of the red soil so characteristic of the place. Through the center of the plateau rises the Sierra de Misiones or Central, which divides the waters between the Paraná and Uruguay rivers, reaching its highest height, 84 meters above sea level (meters above mean sea level), near Bernardo de Irigoyen , in the Cerro Rincón. To the south is the Sierra del Imam or Itacuara and to the north the Sierra de la Victoria, which divides the waters between the Paraná and Iguazú rivers. The latter, when cutting the mountains forms the Iguazu Falls. Photo from one of the footbridges of the Iguazú National Park overlooking Iguazu Falls. Iguazú Falls are the main tourist attraction of the province. In the year 2005 the province received approximately 1,300,000 visitors of which approximately 1,000,000 went to the falls – the vast majority of visitors are tourists. The province itself is surrounded by five rivers, three of which are of great importance: the Paraná, the Uruguay and the Iguazú; the other two are San Antonio and Pepirí Guazú. In them no less than eight hundred permanent courses of water flow and of these, two hundred and seventy flow to the Paraná and the Itaembé stream, one hundred and twenty to the Iguazú and San Antonio rivers, and the rest to the Uruguay and Pepirí Guazú rivers. 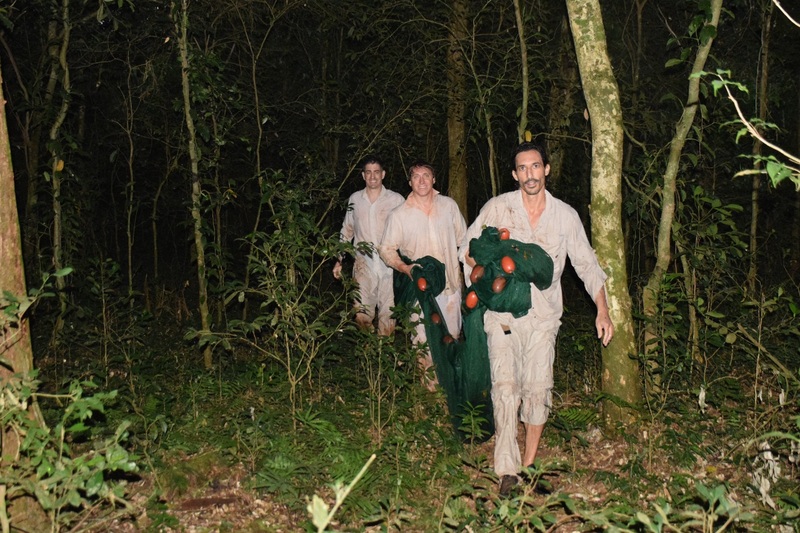 The Misiones jungle (or Paraná jungle) is one of the most biodiverse areas in the world. 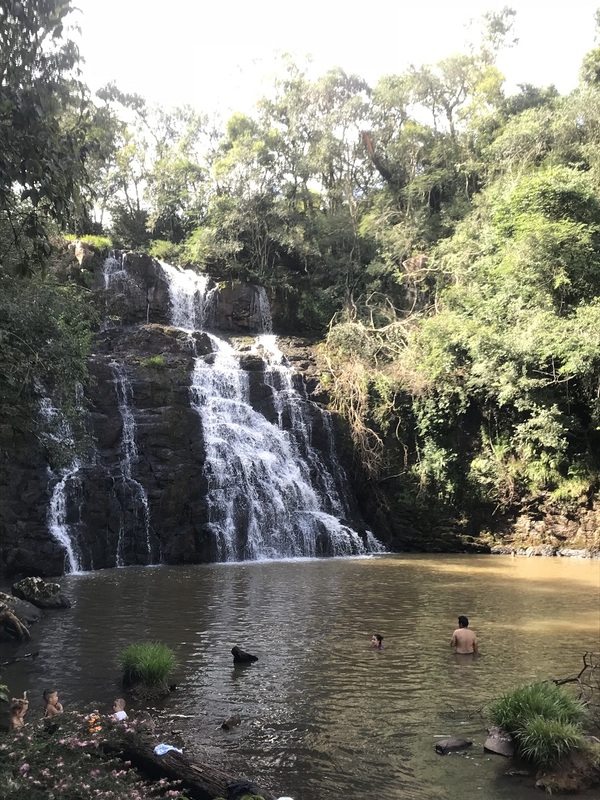 It is part of the Atlantic Forest, an ecoregion that extends from the Serra do Mar on the coast of Brazil, to the east of Paraguay and encompassing much of Misiones. The two ministerial areas of Ecology and Forestry, have established the Special Unit of Green Corridor Management, whose creation law 3631, was sanctioned in 1999, with which it is hoped to ensure the connectivity of the forest mass, in 1 110 000 ha, both private lands and provincial parks. The Green Corridor together with the conservation of parks and provincial reserves, high basins generating clean water, protective forests aims at sustainable development, at the service of the inalienable improvement of the quality of life of man, with a rational exploitation of the forest mass. The Ministry of Ecology and Renewable Natural Resources has as its special mission: to protect the environment and natural species, preserving its character as genetic banks, environmental regulators and sources of raw materials in perpetuity, improving, where appropriate, its productivity; protect terrestrial and aquatic ecosystems and habitats, which harbor migratory, endemic, rare, threatened and commercial use species; protect ecosystems that contain water courses, guaranteeing their subsistence in perpetuity; guarantee biological diversity, genetics and natural ecological and evolutionary processes; minimize soil erosion; preserve the natural, cultural, archaeological and paleontological heritage. But unfortunately, despite all the protection that these regions may have, the human effect is seen with the naked eye and the places of primary vegetation nowadays are very few. The effect of always in all parts of the world, the human advance. Years ago when I went to this beautiful province for the first time I was wondering what fish there will be in the Iguazu Falls but even though I like fish, my thoughts were oriented (as always) towards aquarium fish. I always wanted to inspect these areas and although many ichthyologists and scientists work on them, the appetite of the hobbyist to know is insatiable. The idea was to visit all the possible falls which were not so contaminated by man and which were not restricted areas. 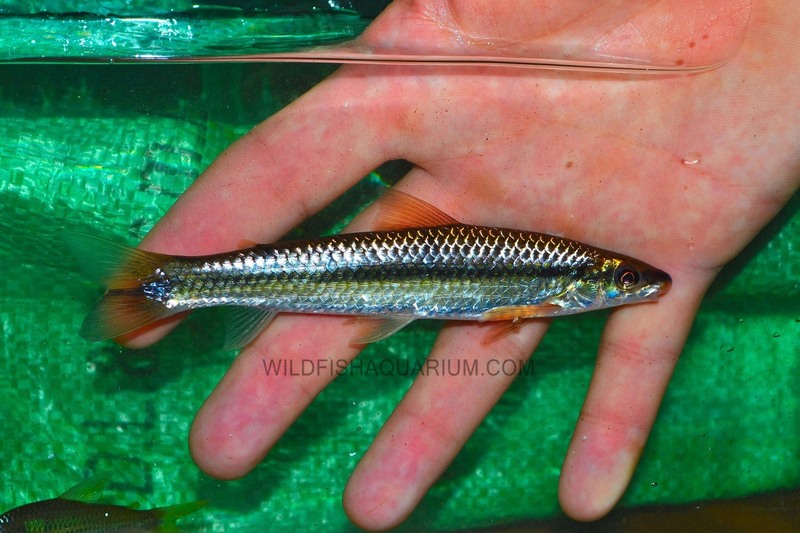 With a team of foreign scientists, aquarium hobbyists and two excellent breeders of ornamental fish, the group comprised our team leader Heiko, Neil Frank. an important ichthyologist from the United States, Freihem Krupp director at the Sckemberg Museum in Frankfurt, Icitiology sector, Angel Fornaro, who is a part of the history of this beautiful Hobby in Argentina, Giampiero Bosi from Intradiscus, an excellent breeder and manager of Discus, Cesar Schmitke, who knew how to be our native guide of the Province of Misiones and knowledgeable about which stream or waterfall there is in the Yerbatera province, we also went to Enrique Soler (wildfishaquarium) and Jorge Marcelo Fernandez, two enthusiasts of aquarium wild fish. Encounter in General Manuel Belgrano, from left to right: Angel Fornaro, Giampiero Bosi, Enrique Alfredo Rodriguez, Heiko Bleher and the author Jorge Marcelo Fernandez. 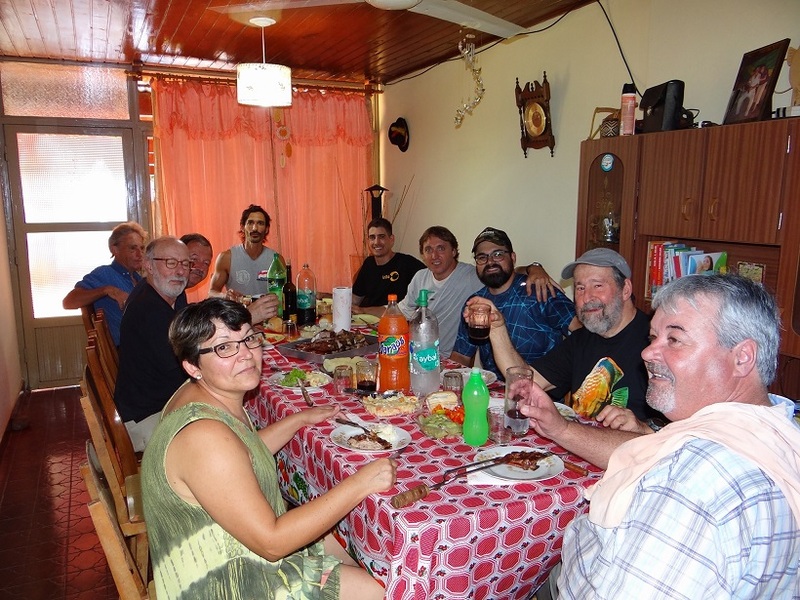 Everything was ready, the others were already in the Province of Misiones and so we left (Angel, Giampiero, Enrique and Marcelo), soon arriving at Posadas and with a car we met at a stipulated point to begin the adventure. 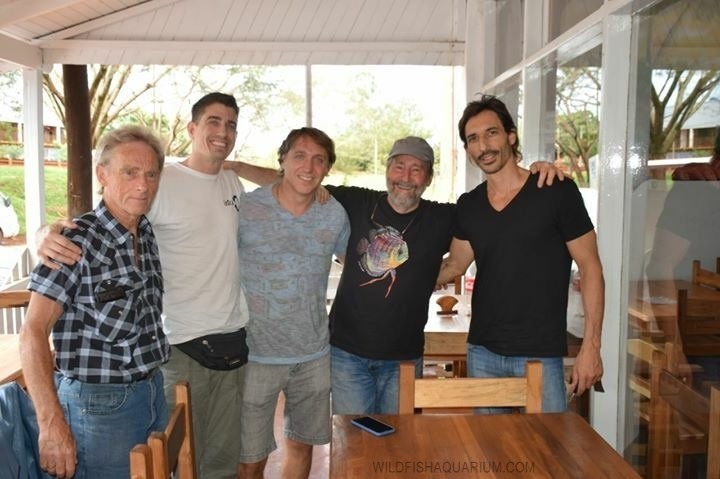 The meeting was exciting, more than anything for those fans of this wonderful hobby, seeing Heiko and Angel together is like seeing part of the history of Argentine aquaristics live and direct which would be the augury of great adventures and sharing many experiences. Two connoisseurs of biotopes, no need to write their names. I had never done an expedition focused only in waterfalls, this was something new for me and for most of the team. Close-up of this beautiful tributary stream of the Iguazú. 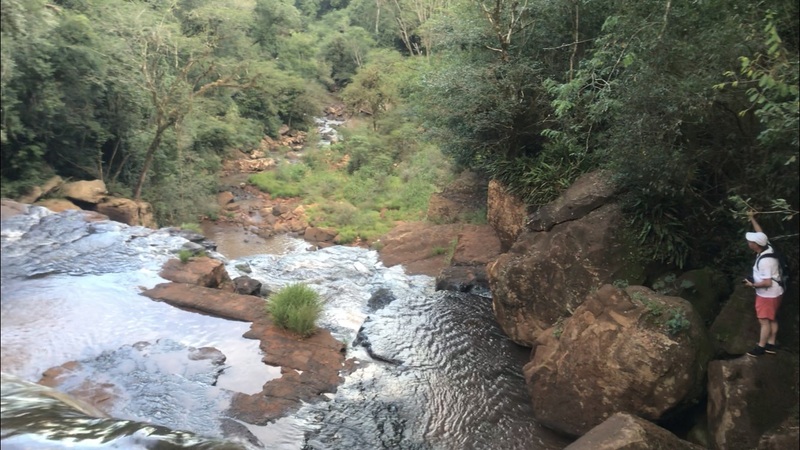 Biotope 1: tributary stream of the Iguazú River next to the falls of the same name. 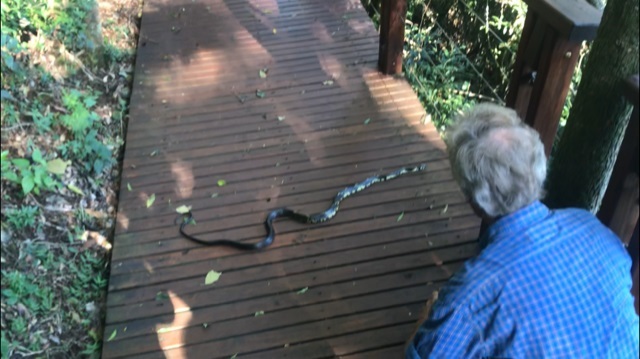 As it is known, fishing in the Iguazú National Park without a special permit is prohibited. But we went to the limit of this to the permitted area and in this place we met local inhabitants who told us the amount of a local species regularly fished for consumption, it is known by foreign aquarists and scientists as Crenicichla sp; we asked if they allowed us to fish and we started the adventure. Action images with Heiko directing the collection. 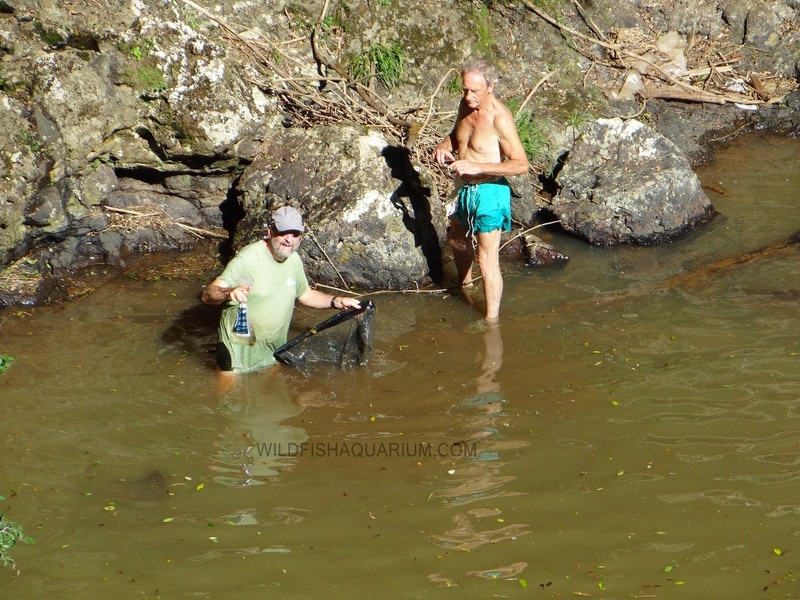 In this case, which would be the only collection site away from the waterfall, we use a large trawl network and the results are visible. Already entered the night, the work done. 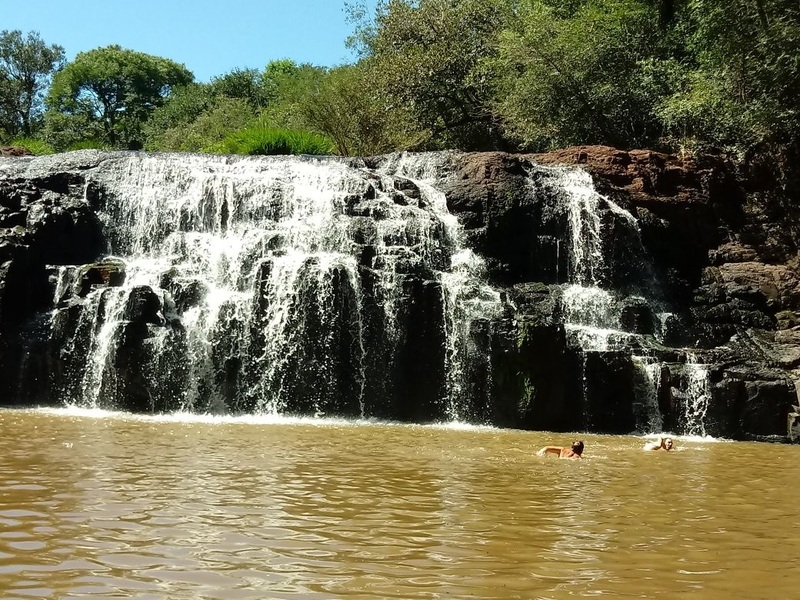 “Salto Verde” (Green waterfall), photo courtesy of Misiones Turismo. 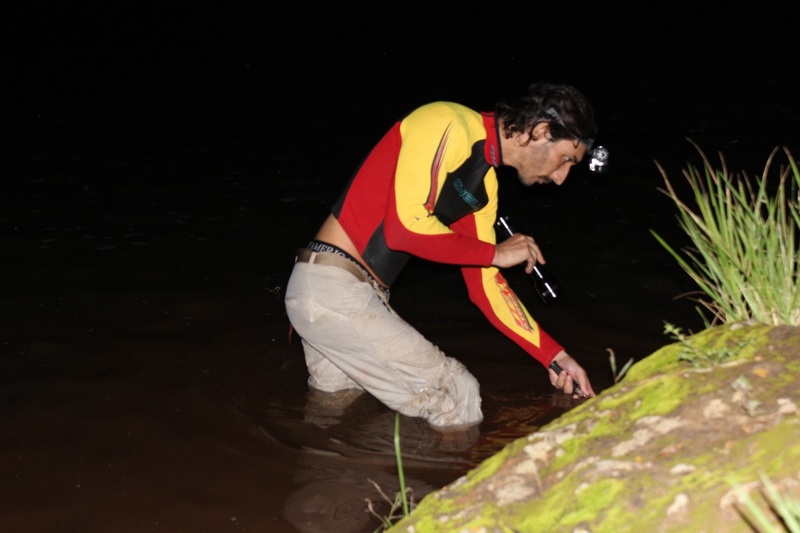 Night fishing with lantern, unfortunately the jump behind is not appreciated. In this case we opted for fishing with a lantern since we were deep into the night. 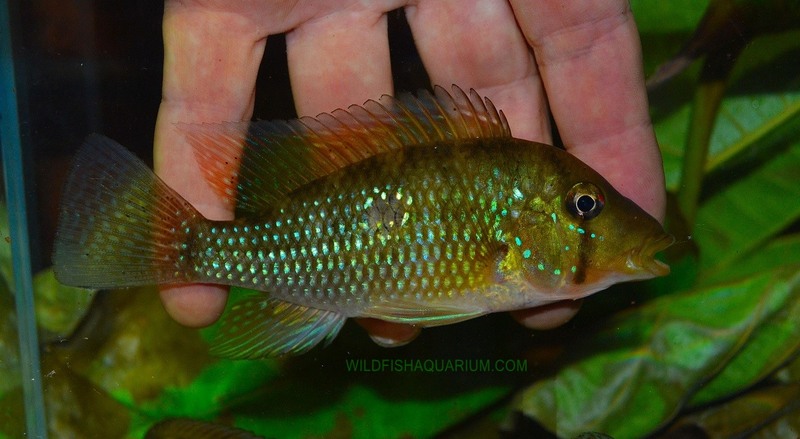 An amazing place in the beautiful dark night, we have seen some beautiful Geophagus and Apareiodon of an impressive size, ideal for a biotope aquarium and with large currents of water. 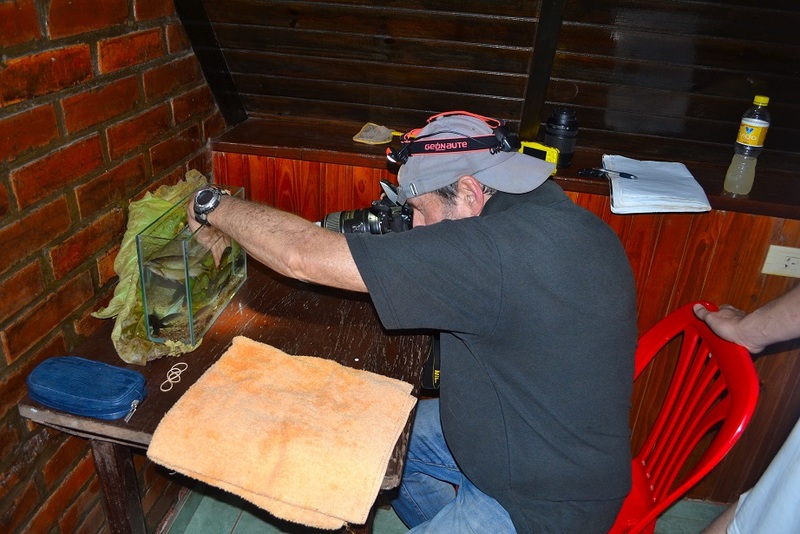 I remember Giampiero and Enrique collecting beautiful cichlids. (G. brasiliensis). A waterfall of a nice size with a lot of aquatic life. A waterfall about 30 meters wide and about 6 meters high. Here we could see how the human beings always succeeds in deteriorating everything in its path. 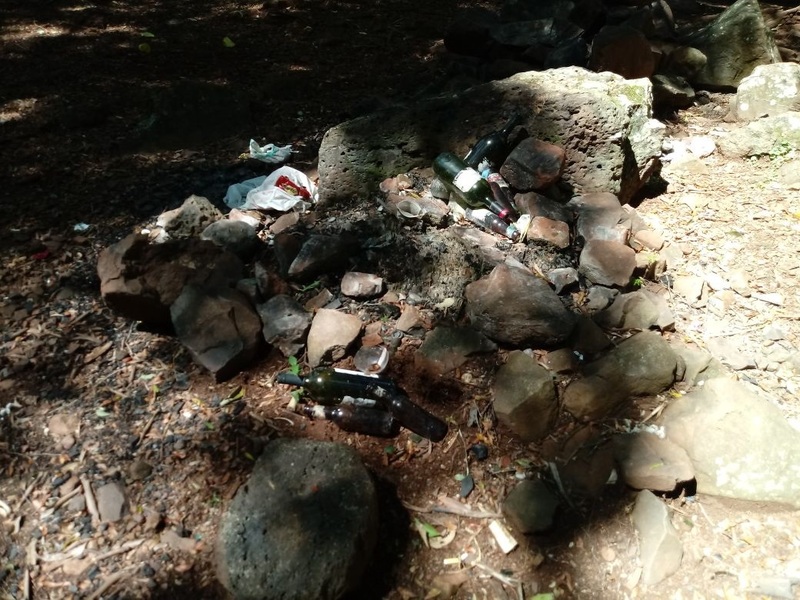 Unfortunately many remains of beer cans and plastic containers were everywhere, luckily a lot of fish in places of significant current and some impressive Echinodorus sp. with red coloration due to exposure to strong sunlight. The human always leaving his mark, is unfortunate. This is where I realize that this has no return. Echonodurus uruguayensis, here the green version, in shallow to the maximum sunlight and where there is excessive water flow. 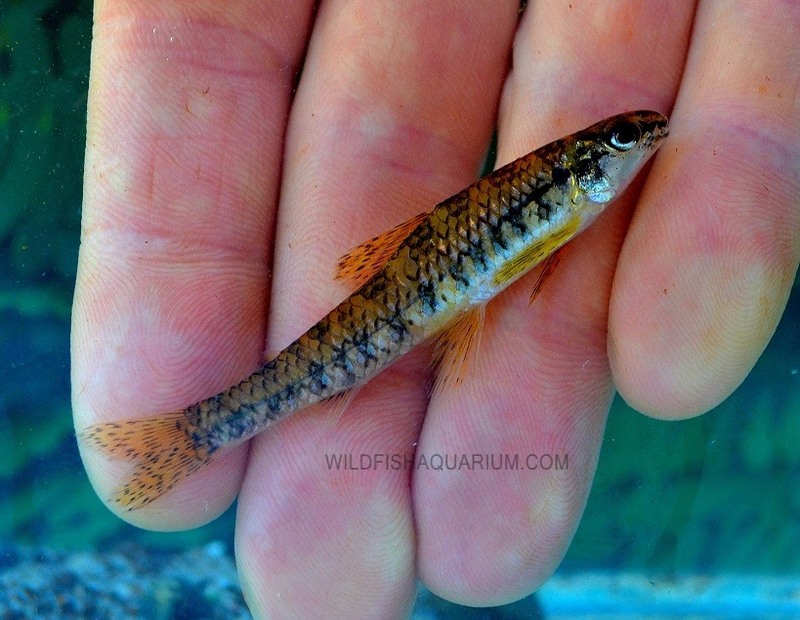 Fish of the Trychomectirae family, perhaps T. stawiarski. They were in the Echinodorus sp. from the previous photograph where the current was intense. 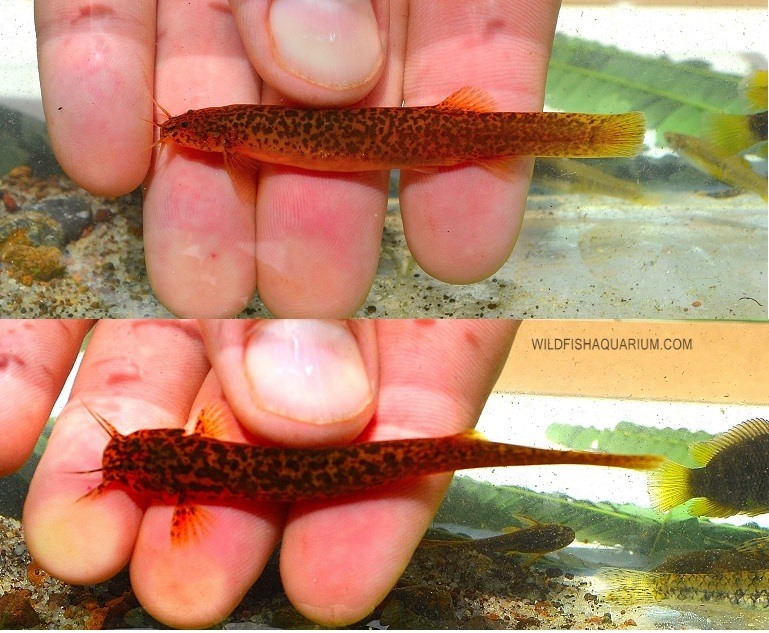 Juveniles of Australoheros ykeregua and a Hemiancystrus sp. A few beautiful female and male specimens respectively of Phalloceros sp. worthy for a biotope aquarium; a species with colours in the gonopodium. 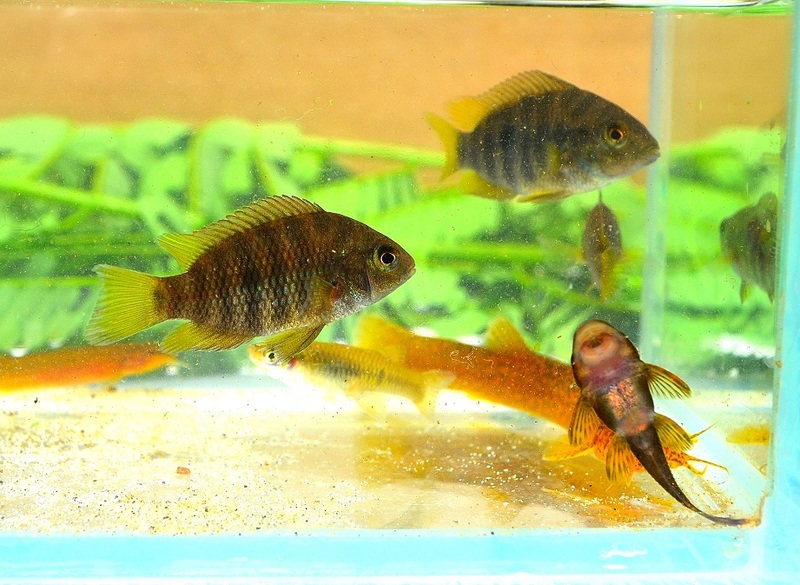 Characidum sp. 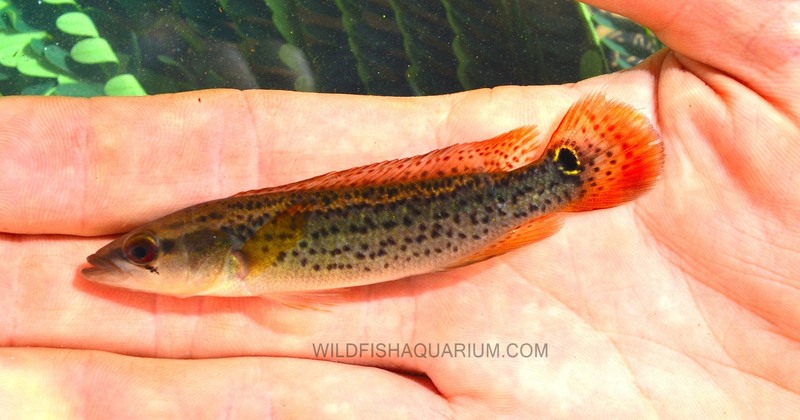 a beautiful population of coloured fins. Maybe a C. heirmostigmata, recently registered for Argentina. Great part of the team. 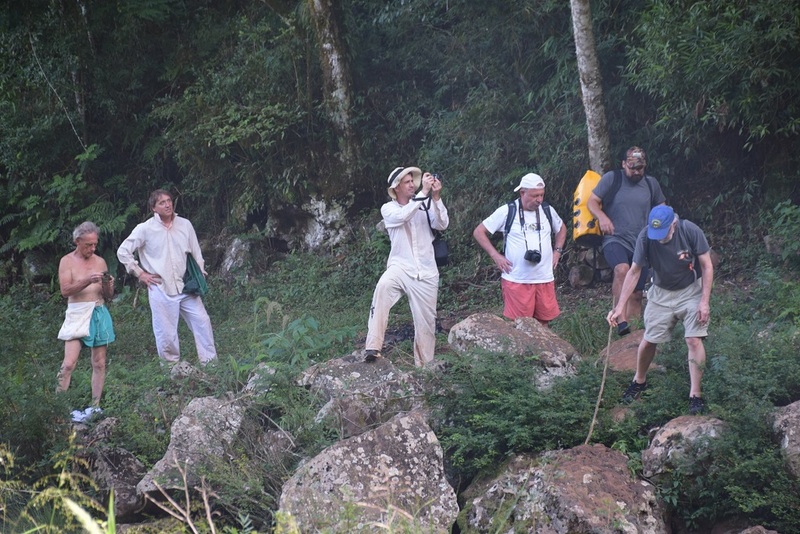 After a long walk it was possible to reach the jump, here we all observed what you see in the next photo. A memory forever. 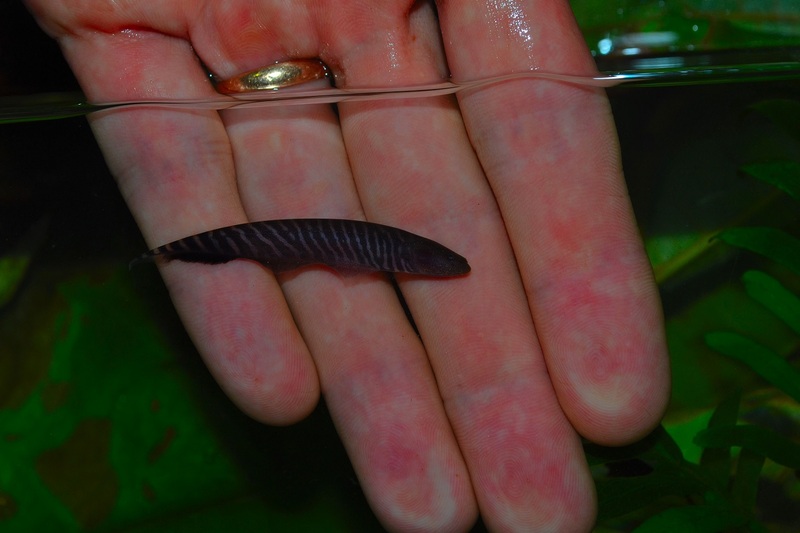 “Salto El Soberbio” with its formed piletón where we managed to capture a pair of beautiful Crenicichlas sp. The parameters that this place showed: pH: 6.50, Conductivity: 79Us, Average water temperature: 23 ° C.
View of the Salto from above, on one side, in a few meters below us, was Friehem Krupp and below, the end of the jump. If you look closely at the route you can see its height. 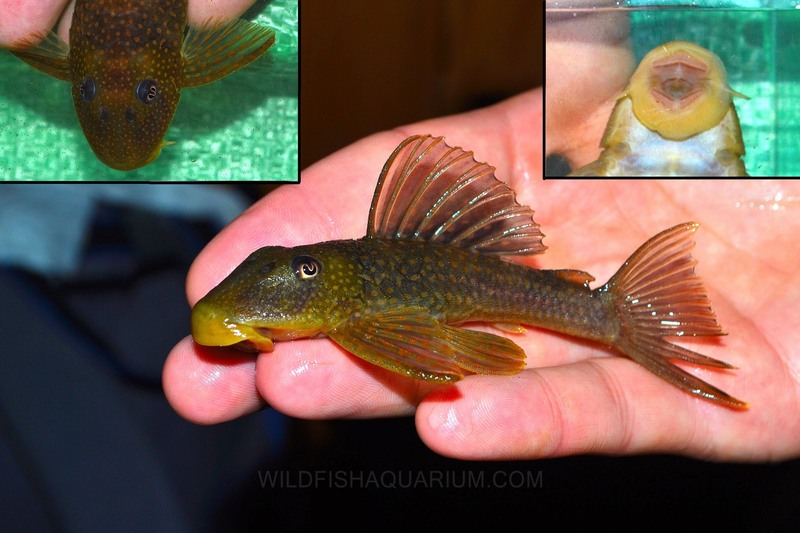 We were able to see beautiful Phalloceros sp., Several tetras of the Astyanax family and some catfishes of the Trychomectirae family. 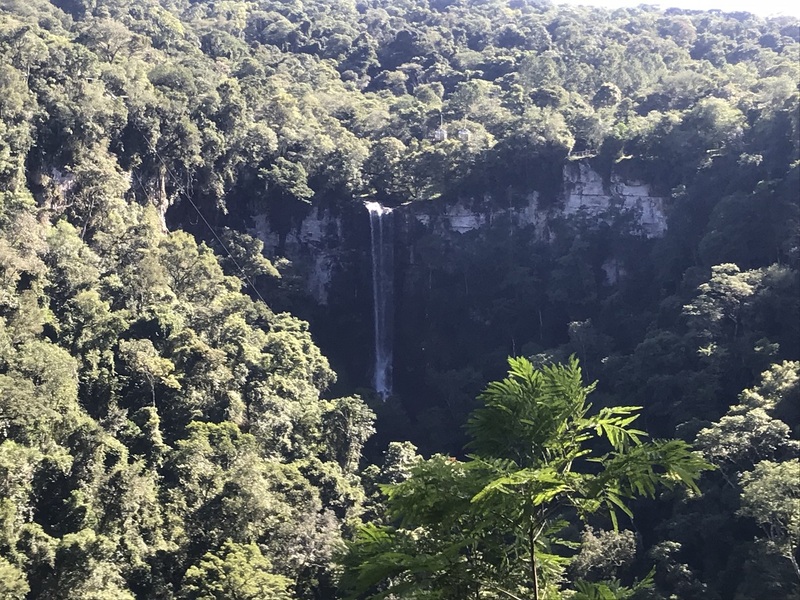 The parameters that this place showed: pH: 6.70, Conductivity: 77Us, Average water temperature: 24 ° C.
After a few days of expedition, the family of our friend and guide on this trip Cesar Schmitke, would take us to see a wonder of the Saltos de Misiones, El Salto Encantado, inside a protected reserve called “Parque Provincial Salto Encantado”, by that the networks were in Cesar’s house but the charm of this magical place is impressive and it was worth visiting. 64 meters of free fall, impressive. A beauty in full reserve, “Ñacanina Jú” (Spillotes pullatus). Angel in the first row !. 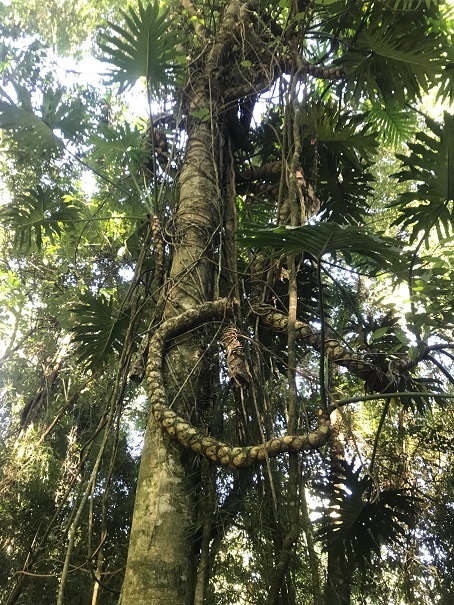 Inside the reserve an amazing Philodendron bipinnatifidum, about 3 meters high. 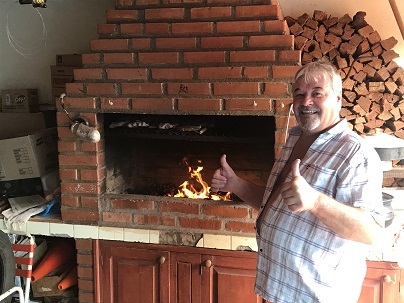 After the visit to this unforgettable leap and corroborating because it is the Salto “Encantado”, Cesar’s father, Mr. César Heriberto Schmitke, was waiting for us with an “Asado Misionero”, with many pickles and several delicious things. A beautiful table where Cesar father told us that he had always worked for tea companies that together with Yerba Mate (a drink made from Ilex paraguariensis) are the two main activities of the province. All very rich and pleasant, we will always be grateful for the time and kindness of this beautiful family. Once lunch is over, we head towards the Yabotí reserve, an amazingly intact place with an almost complete stretch of river within the boundaries of the reserve, El Yabotí shares a reserve with another river of greater flow “El Uruguay”; the latter divides the borders between Argentina and Brazil (and is home to the second most famous of the “jumps” of the Province: “The Moconá Falls” or called Yucumá Falls on the Brazilian side). 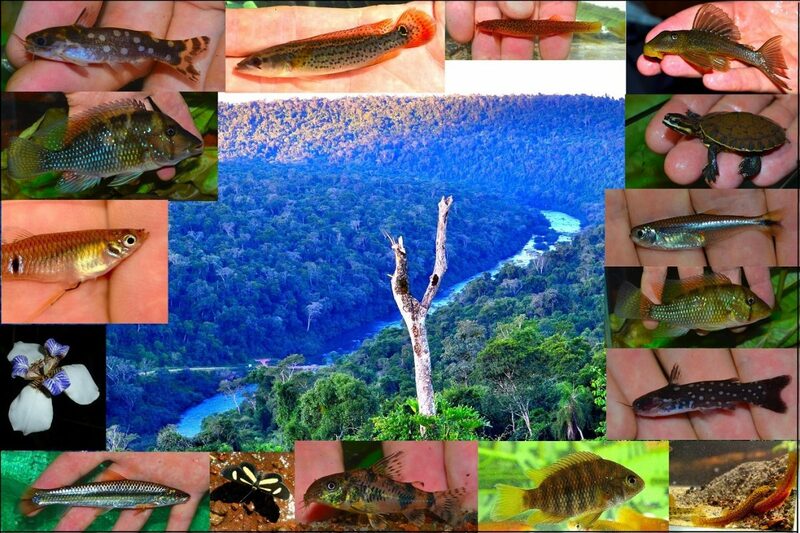 Let’s start with the Yabotí River, in my opinion the best variety of fish in the province of Misiones, it is impressive the amount and variety of species that are in this river, you can see in the video of the channel Wildfishaquarium of youtube: https: // www.youtube.com/watch?v=FKe97nKoAvk&t=255s if you have the chance to see it about 10 minutes of this video is dedicated to underwater filming of this place. 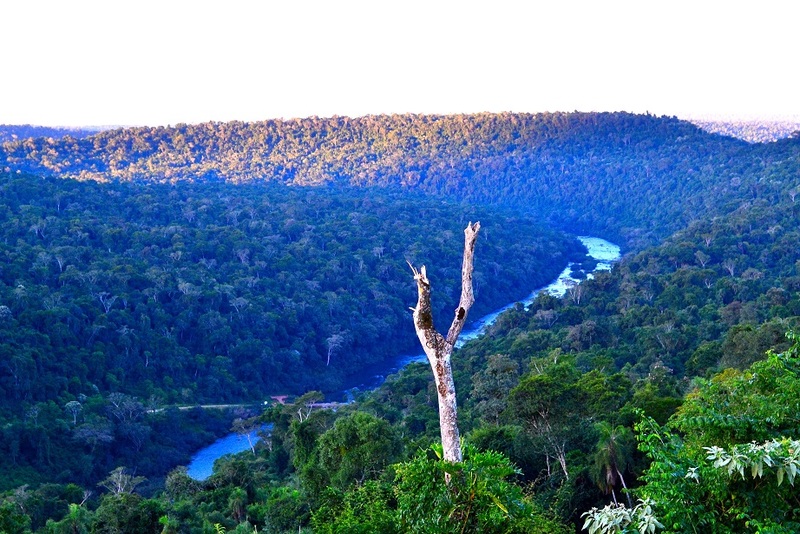 An image of the course of the Yabotí River, totally surrounded by primary forest. Although you can not fish or make collections without the proper permits we could snorkel, appreciating different varieties of fish “tetras” family characidae, different members of the Loricariidae family, we saw at least three species of Crenicichla sp, other cichlids including Australoherus and Keregua, Leporinus striatus, Apareiodon sp, Phalloceros sp., Among others, all surrounded by virgin primary forest (all intact). 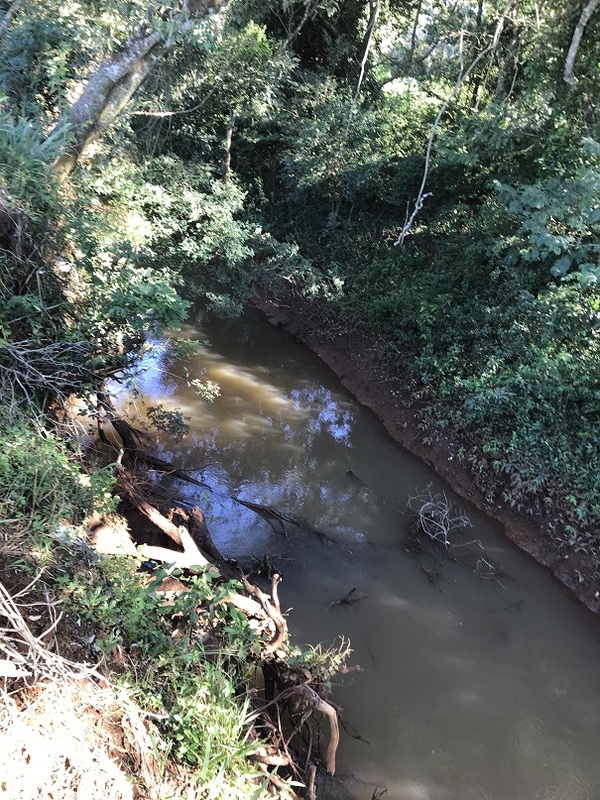 Much of the river bank was covered by the shrub “Sarandí” Phyllanthus sellowianus, characteristic of this Province, a hydrophilic shrub of the filantaceae family, with a history very particular since it was declared a national historic monument in Candelaria Province of Misiones, because the hero General Manuel Belgrano before crossing the Paraná River to Paraguay with his liberating expedition of December 1810 used the shade of this shrub to rest and enjoy meditation. Here we see the coastal vegetation composed of the hydrophilic bush Sarandí, while Enrique de Wildfishaquarium contemplates the amount of fish at his feet. 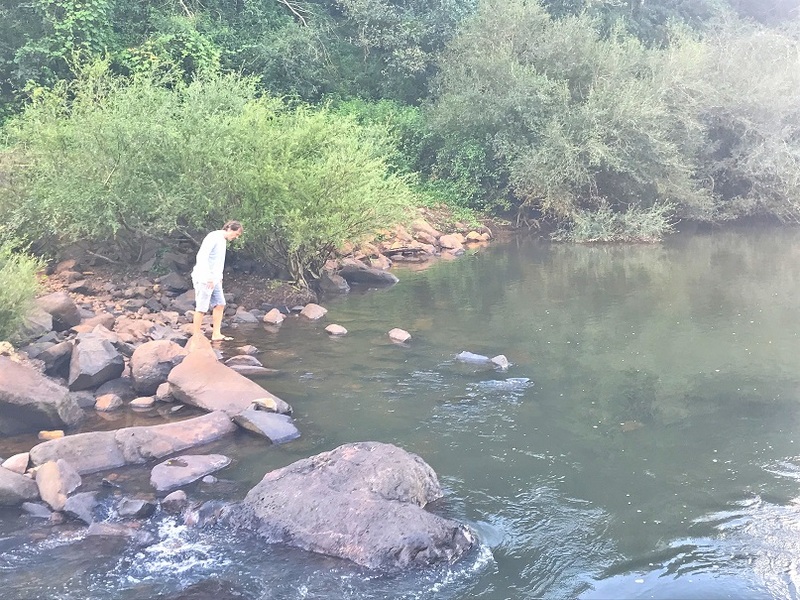 We had already been informed that the Yabotí River was very rich in fish fauna that would enthral our sight with so much life and the truth was that this was absolutely right; the place is a paradise not only for fans of the aquarium but for all nature lovers. 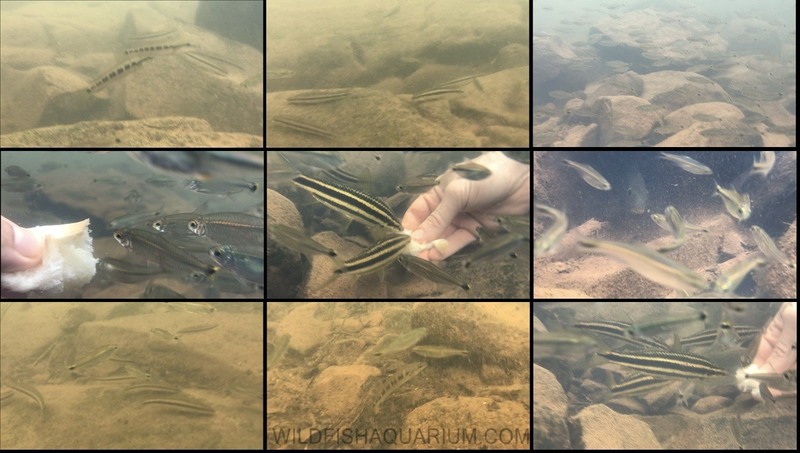 Several instants of the Snorkel in Rio Yabotí, in order of photos from left to right, above: Pair of Crenicichla sp (dwarf), school of Apareiodon sp feeding (always in school of minimum 5 or 6), thousands of tetras (Characidae family) . 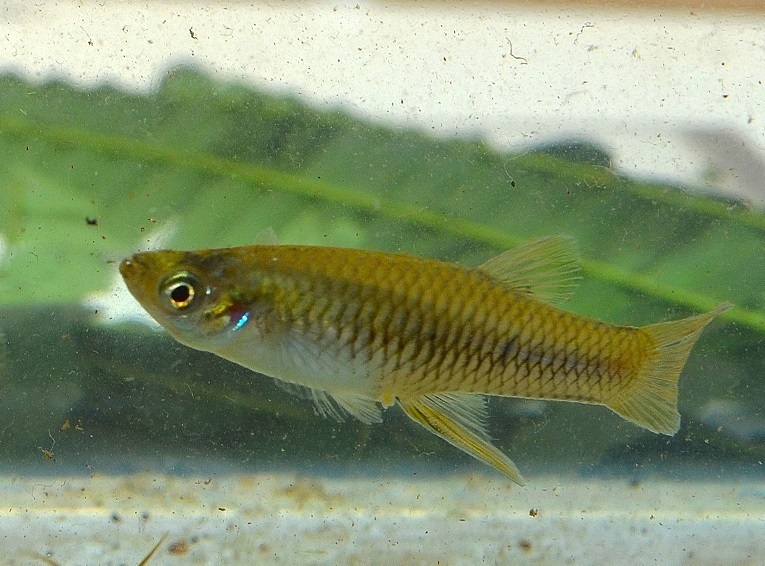 Medium: Tetras close-up, Leporinus striatus eating by hand, Australoheros and keregua in cave. 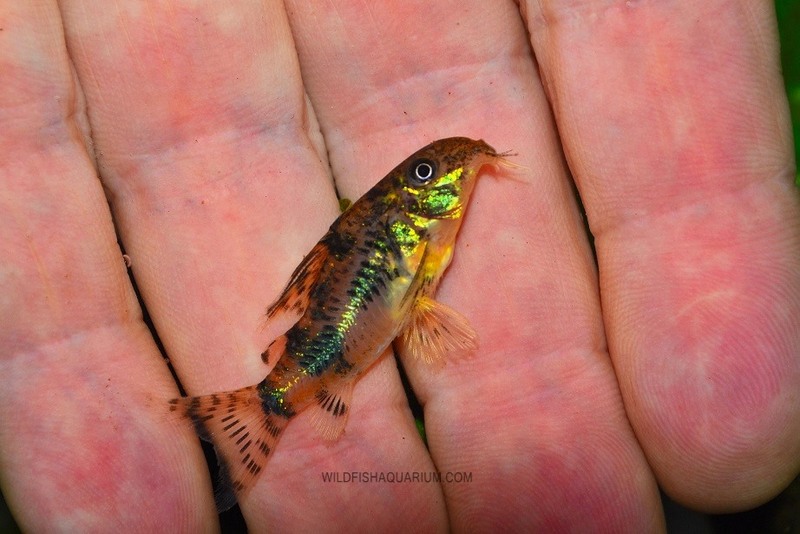 Below: Mas Apareiodon sp., Crenicichla sp. 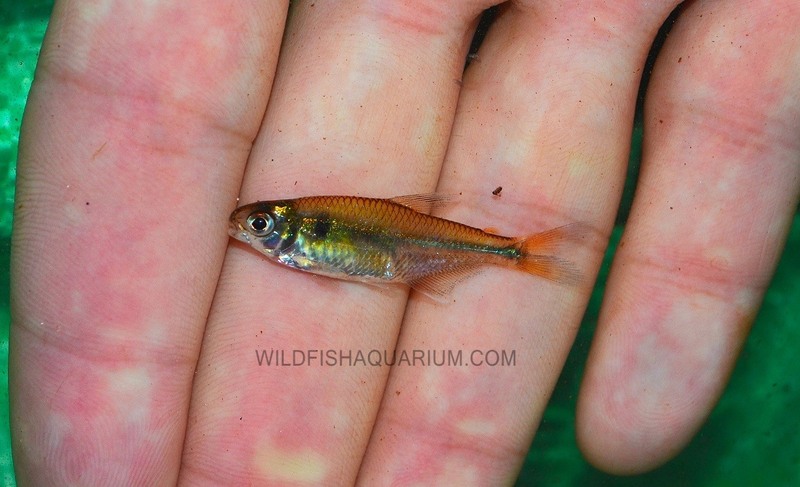 and several tetras and L. striatus eating by the hand. There are many other species that can be seen in the previously named filming. Part of the Moconá Falls, an extension of 3 km in length. 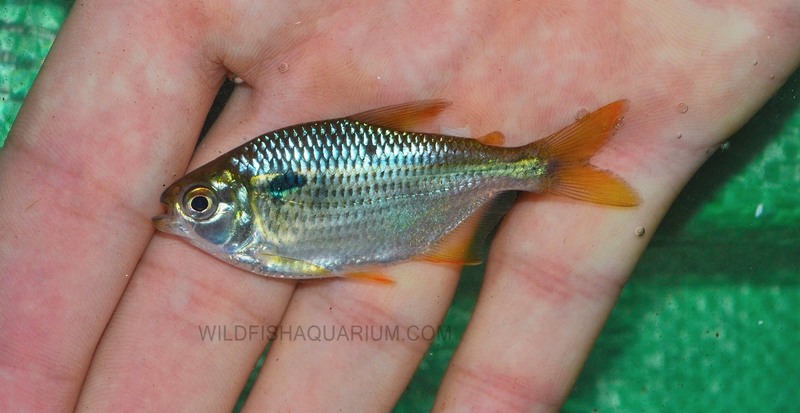 A tetra of fast waters with an ideal coloration to be contemplated in aquarium (Bryconamericus uporas). Thanks to this wonderful group that formed this expedition and thanks as always to my wife and children for putting up with this crazy fish and their biotopes; I must also extend my thanks to my partner Gabriel for covering me at work. There are always conclusions in each place that I visit, each biotope has something so particular that it is worth learning and enriching our knowledge. This province has some beautiful ornamental fish and many aquarists from different parts of the world would like to have them. Imagine a biotope aquarium with great currents, rocks and good lighting, with its Echinodorus and Sarandi shrubs on its edges, it would be something beyond what we are used to, simulating dry and rainy seasons with all these fish that we saw in it, growing and teaching us how to live in nature. 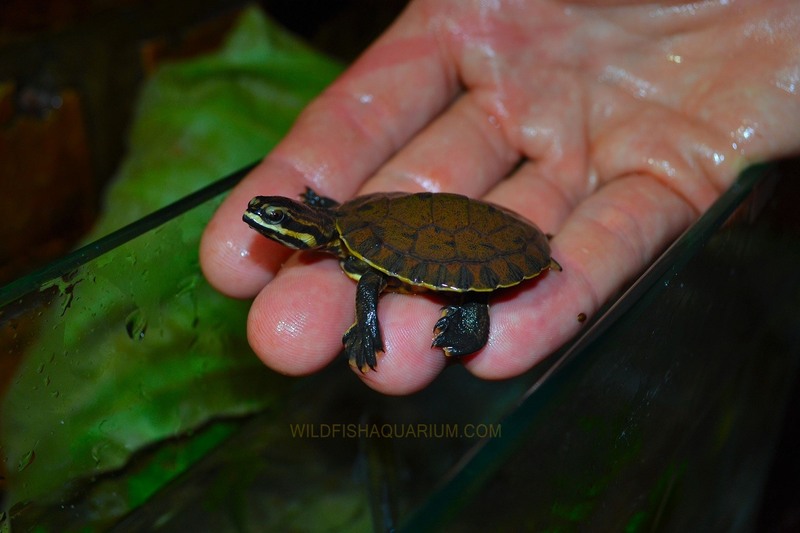 Many aquariums are already well designed and armed with other fast biotopes, but none quite like the Missiones Falls!